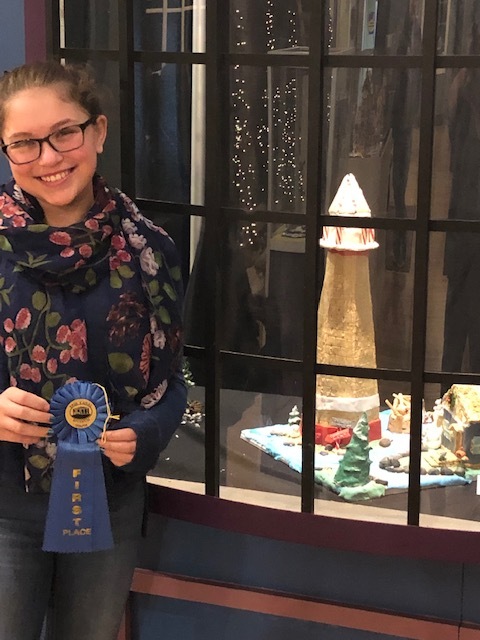 For many years, Solvay Union Free School District eighth-grader Kaylah K. has been participating in a sweet pastime – making gingerbread houses. Kaylah has spent the last few years creating gingerbread houses for the Erie Canal Museum Annual Gingerbread Gallery. This year, Kaylah’s hard work paid off, as she received the Judge's Choice Award for first place winner in the Youth Category. This past holiday season was the 33rd Annual Gingerbread Gallery at the Erie Canal Museum in downtown Syracuse. For the gallery this year, Kaylah created a gingerbread piece all on her own for the first time. She designed a large lighthouse with a home, vehicle, and boat. Each submission to the Gingerbread Gallery must be completely edible, except for the base. After troubleshooting a few attempts to get the elements to stand, Kaylah was rewarded for her efforts with her first place award. 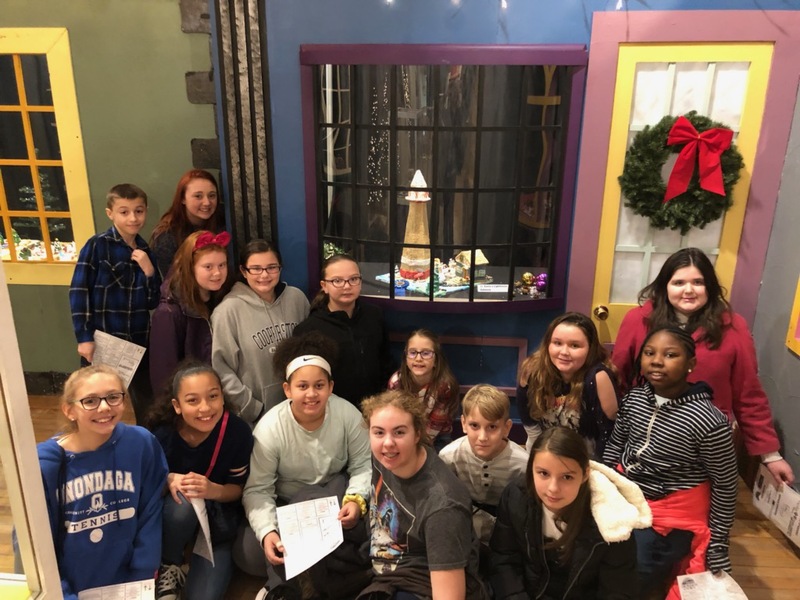 During the holiday season, Ms. Nadzan and Ms. Cole took a group of Solvay students to attend the Gingerbread Gallery event and see Kaylah’s work up close. Students enjoyed being able to see Kaylah’s winning work, along with the other submissions to the gallery. Over the years, Kaylah has submitted a variety of different confectionary creations to the Annual Gingerbread Gallery. Her submissions have included a large pink home, a barge with Santa, a train carrying gifts, her version of a snoopy Christmas, and a piece displaying various Dr. Seuss characters. Each piece she creates has several personal items hidden in it, such as replicas of her pets made in fondant. She has won the People's Choice award multiple times. Kaylah already has her ideas planned out for next year, but she is keeping them a secret. 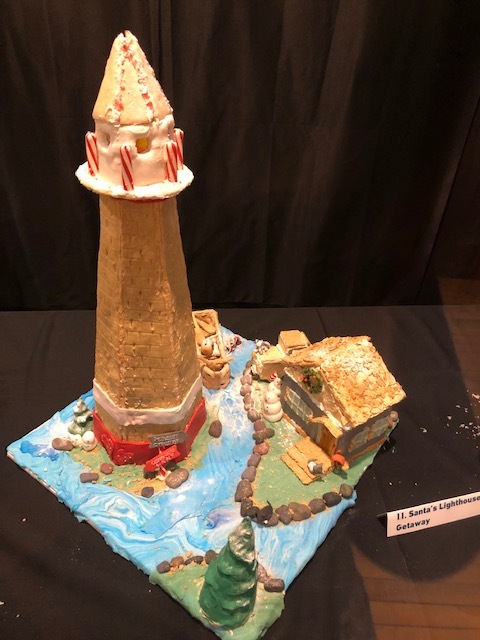 Be sure to attend the Annual Gingerbread Gallery at the Eric Canal Museum during the 2019 holiday season to find out what she designed! Great job, Kaylah!